King’s X is a peculiar band. Not easily pigeonholed as hard rock, metal, or alternative, they’re the anchovies of modern music – you either love them or hate them. Of course, you only hate them because you don’t understand them. I always had difficulty turning friends on to the band, but there are a few rare occasions where I met someone who was already a fan and we became instant friends. Since 1988, King’s X has been a connoisseurs band. Admired by other musicians and artists, acclaimed by critics, and adored by their loyal fans, King’s X has never broken through to the mainstream, but have persisted nonetheless. Perhaps the most infuriating reason this has happened is because of the bands openness about their spirituality. Sadly in the 1990’s you couldn’t mention having Christian faith in a rock or metal magazine without instantly being black listed, or less severely – seen as “uncool.” The fact is that the members of King’s X have never claimed to be a Christian rock or metal band. But, this is the world in which we live. 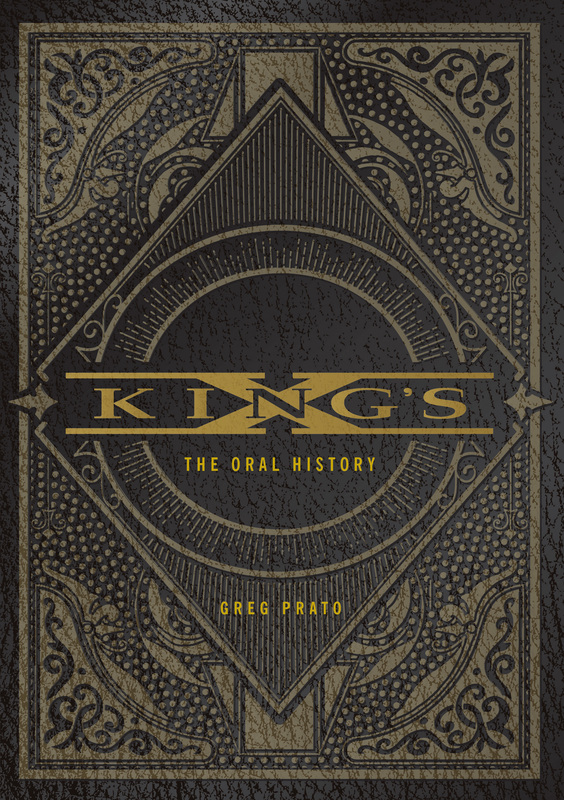 Greg Prato’s King’s X: The Oral History is the definitive account of the bands history. Literally no stone is left unturned. Every song on each album of their discography is discussed, as well as their earliest days, tours (like opening for AC/DC and Pearl Jam), and navigating the ever changing musical landscape as a singular group with no real place to call home. Indeed with the rise of grunge in the 90’s and the subsequent emergence of nu-metal, it only became more difficult for the band to fit in. With the oral history approach, Prato lets the band speak for themselves. First, this approach makes for a more candid book that isn’t blurred behind a veil of the writers own bias. It also gives each members personal story a place to be heard. Second, Prato takes it further by bringing in a who’s-who of musicians to testify to King’s X’s greatness. Scott Ian (Anthrax), Andy Summers (The Police), Kim Thayil (Soundgarden), Billy Corgan (Smashing Pumpkins), Mike Portnoy (Dream Theater), Marty Friedman (Megadeth), Robert DeLeo (Stone Temple Pilots), and Nuno Bettencourt (Extreme) are only some of the high caliber musicians on hand to celebrate the band. Through their testimonials, the influence of King’s X is more strongly felt than had the author decided to just wax poetic about Gretchen Goes To Nebraska ad nauseam. The book is composed of 27 chapters across 326 pages and includes numerous rare and never-before-seen photos of the band. This book is essential to the collection and continuing education of all King’s X fans. Too few people will seek out this book if they’re not already familiar with the band, which is a damn shame. For one, it’s an illuminating read for anyone who values individuality and staying true to their artistic vision. Further, the book is insightful for any young band who thinks landing a major label deal or high-profile tour means that they’re on the verge of making it big. Not that it’s a cautionary tale, rather it values personal integrity over rock stardom. If you’re chasing the latter, this is meaningless. But, if your aim is to endure and gain the undying respect of your peers and fans, then this book is required reading.